Villa Flavia is a very stylish and luxurious house, designed and built by an owner who is an international landscape and interior designer. Built in the tradition of an old Tuscan farmhouse but with all the benefits of modern conveniences. Attention has been lavished on the interiors to give them an elegant feel while also maintaining the feeling of a family home. This property has been photographed several times and published in House & Garden, Elle Decor and the best selling book Private Tuscany. Personal touches are evident everywhere and combine to make it an excellent venue from which to explore the Tuscan and Umbrian countryside. Indoor: Sleeps up to 13 persons with seven bedrooms and six bathrooms. The attention to detail is second to none down to the quality of the bed furnishings, individually sprung mattresses and luxurious bathrobes supplied to make this much more than just a holiday villa. Games and books in various languages can be found in this superbly comfortable family holiday home. The house sits on top of a hill within 50 acres of woodland and olive groves with panoramic views of the Sienese countryside, yet is only a 5 minute drive to the nearby charming medieval village of San Casciano dei Bagni where you will find many fine restaurants, shops, bars, cafes, banks, pharmacy and the local ancient Roman Spa (Central Termale Fonteverde) which has undergone an 8 year renovation program and is now one of the most appealing health spas in Europe. Nearby tennis court. 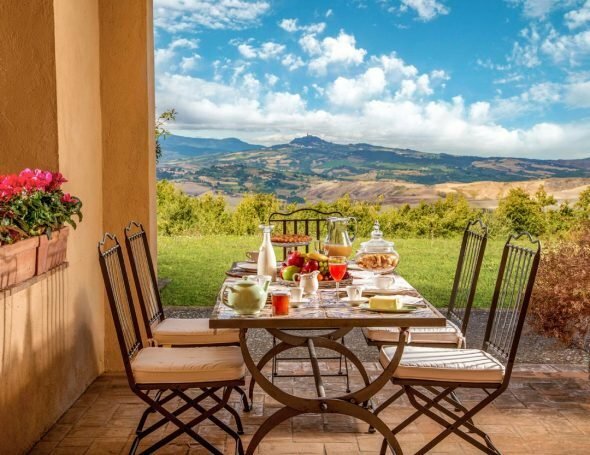 As Villa Flavia is newly available for rental, there are no guest comments to date. Massimo Villas team member, (Angelo), has visited the property and is happy to answer any queries.